Injuries can occur anywhere, and sometimes they are the result of negligence. The legal team at the Olsen Law Offices understands this, which is why we stand with injury victims and their loved ones throughout San Diego. We offer expert legal counsel for all kinds of accidents, helping the injured receive just compensation following accidents that occur as a result of another person's poor actions or failure to act. The legal help we provide is especially important in premises liability cases, particularly when a client has a slip and fall lawsuit against a negligent business or property owner. Let's take a moment to consider one of the most common causes of slip and fall accidents: wet and slippery floors. While many people take their danger for granted, wet floors can result in serious injuries. 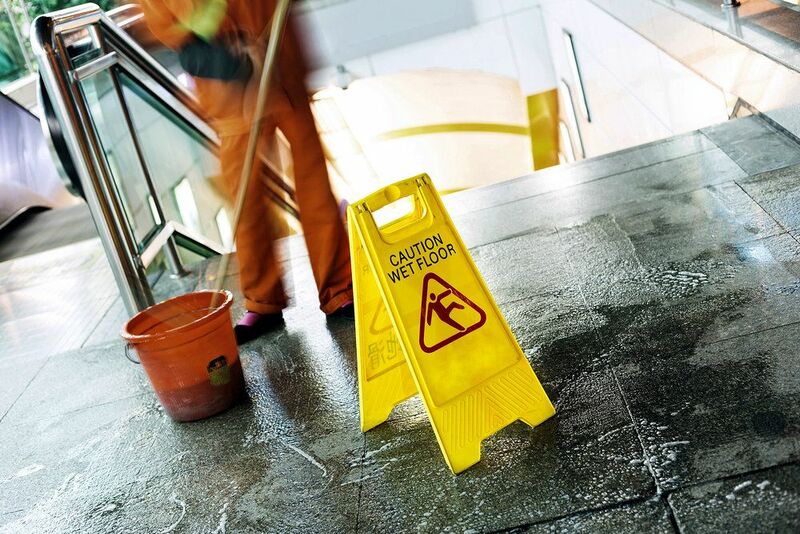 A number of preventable slip and fall accidents are the result of spills, leaks, and other issues that may result in slippery surfaces on stairs and other surfaces. These kinds of situations need to be attended to right away by employees and property owners in order to keep visitors and customers safe from harm. If not, this could be grounds for a premises liability lawsuit. The exact nature of the spill or slippery area can vary based on a number of factors, such as the type of business (i.e., restaurant, grocery store, hotel, hospital) and potential inclement weather. What Sorts of Injuries Can Occur? When a slip and fall accident happens, the injuries to the victim can be quite serious. While bumps and bruises are common, it's also possible for people to experience pulled or torn muscles, sprained joints, and even broken bones. The injuries are much worse if the slip leads to a major fall down stairs or from a ledge. Property owners and employees can take some basic measures to limit the potential of a slippery surface at a property. For one, employees can periodically walk the establishment and note any possible spills or causes of a slip in the area. This allows hazards to be attended to promptly. Proper maintenance of pipes, ceilings, and roofs is also important to consider as this prevents leaks from occurring. During wet and rainy weather, it's a good idea for businesses to have absorbent mats by entrances to help reduce the amount of moisture brought into the business. Periodically dry mopping high-traffic areas is also helpful for limiting hazards to people on the property. When a spill or a slipping hazard is encountered, the best thing that employees and property owners can do is clean it up as soon as possible. Even just laying down a wet floor sign in the area can significantly increase safety and prevent serious harm from happening. For more information about slip and fall accidents and how our team can help you, be sure to contact our personal injury law firm today. The Olsen Law Offices are here for you in your time of legal need.